Div for starters? I don't think so - you are putting up monster numbers here! Excited for your 2016 goal - thinking somewhere between $1,000 to $2,000 for dividends to be received? 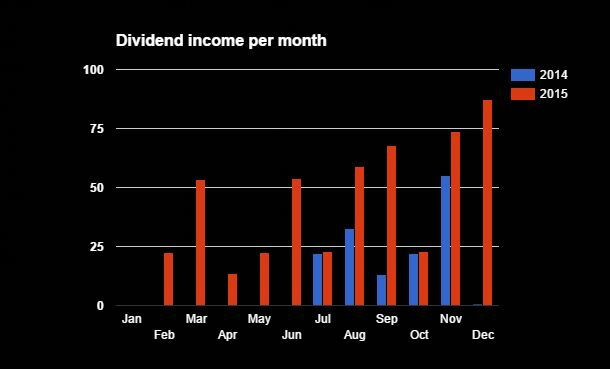 Congrats and looks like you have some nice dividend aristocrats there. Keep it up. Wishes you have a better 2016! Happy new year to you too! Thanks for your wishes. Great December dividend income and great YoY progress. Waitind to see your 2016 dividend income goal. Best wishes and a happy new year to you too! Congrats on achieving your goal! Best wishes! Looking good! Both of us are quickly approaching that $100 in a single month. Can't wait! The future looks bright. You and I both! I'm very interested to see what 2016 will bring us. Best to you too Dividend Beginner!